The global medical imaging equipment market is moderately consolidated in nature and is expected to remain in the similar scenario throughout the forecast period, stated a new market research study by Transparency Market Research. Some of the leading players operating in the global market are Philips Healthcare, GE Healthcare, Siemens Healthcare, and CareStream Health, Inc. In 2014, the above mentioned players collectively accounted for a share of 51% of the global medical imaging equipment market. The healthy competition among the leading players in terms of cost of product will be seen in the next few years. The key players in the market are focusing on research and development activities for the expansion of product portfolio, which is likely to generate potential growth opportunities in the next few years. According to the market research study by Transparency Market Research, in 2013, the global market for medical imaging equipment was worth US$27.70 bn. The market is projected to reach US$45.30 bn by the end of 2022, exhibiting a 5.60% CAGR between 2015 and 2023. Among the regional segments, North America is expected to witness a high growth throughout the forecast period. In the last few years, this region accounted for a large share of the global market and is projected to remain in this position for the next few years. The high growth of this region can be ascribed to the rising demand for enhanced imaging devices. In addition to this, the development of the healthcare infrastructure, which has resulted in a high demand for technologically-advanced medical imaging equipment is predicted to accelerate the growth of the overall market in the coming years. As per the research study, North America is anticipated to register a 4.60% CAGR between 2015 and 2023. 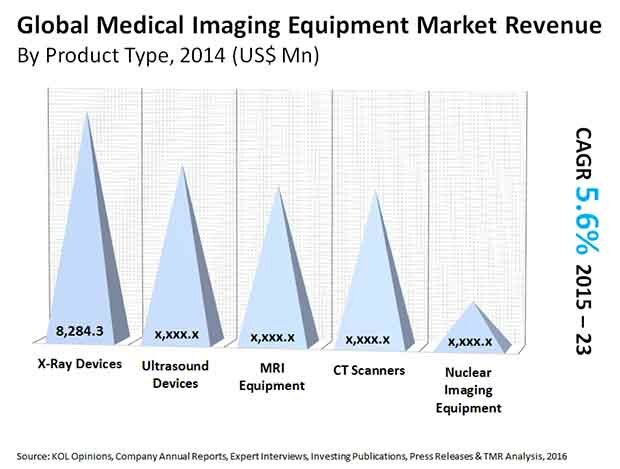 The global medical imaging equipment market has been categorized on the basis of technology into ultrasound systems, magnetic resonance imaging equipment, computed tomography scanners, nuclear imaging equipment, and X-ray devices. Among these, the x-ray devices segment is expected to witness a high growth in the next few years. The increasing use of x-rays and its assistance in diagnosing a wide range of complicated diseases are the major factors that are anticipated to accelerate the growth of this segment in the next few years. Technological advancements in the 3D imaging technology is one of the major factors estimated to encourage the growth of the global medical imaging equipment market in the next few years. The development in the computer-aided detection and the rising applications for imaging diagnostic applications are the some of the other key factors that are likely to drive the global market in the next few years. In addition to this, the increasing incidence of a large number of diseases, including orthopedic, respiratory, and cardiovascular is predicted to result in a high demand for medical imaging equipment throughout the forecast period. On the other hand, the reduction in the budget of healthcare is anticipated to restrict the growth of the global medical imaging equipment market in the next few years. In addition, the rising awareness among doctors regarding the hazards of the radiations by imaging devices is estimated to curtail the growth of the market throughout the forecast period. Nonetheless, the rising prevalence of several chronic diseases is anticipated to generate promising growth opportunities for the market players across the globe. Increasing cases of chronic diseases is one of the key factors estimated to boost the demand for medical imaging equipment in the coming years. Technological developments and innovations to generate promising growth opportunities for the market players.